New Hope for Children Orphanage: We are preparing a very special gift for our sponsors and partners! We are preparing a very special gift for our sponsors and partners! 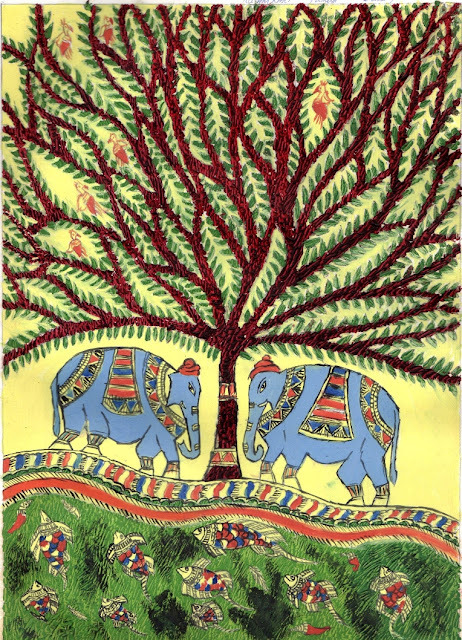 Join us and receive a beautiful print of Stanish's painting, "Elephants Under the Tree"
In a few weeks, we will have available a very special gift for our sponsors and ministry partners: a high quality, signed print of this painting by Stanish. Stanish grew up at the New Hope for Children Orphanage in Bangalore, and God has blessed him with a talent for drawing and art. His painting, "Elephants under the Tree", is one of our favorites. We are having a limited number of prints made on archival, museum-quality paper. If you are already an orphan sponsor or a ministry partner, we will send you one of the prints as our way of saying thanks for blessing the children at New Hope Orphanages. If you are not yet a ministry partner, don't miss out on this opportunity to receive this special edition art print! You do not have to sponsor a child to partner with us. Anyone who contributes $120 for the year (or establishes a monthly donation of at least $10 per month) will receive the limited edition print. If you are not already our ministry partner, just click on the GIVE button below to get started. You can contribute online using credit card, bank card, or direct debit from your checking account. If you prefer not to enter your information online, you can print out our donation form and mail it to us. Our online donation page provider uses the most secure technology available.